eBits n ByteZ, Issue #001 -- BIG Changes in 2015! Hello and welcome to the inaugural eBits n ByteZ newsletter, courtesy of eComputerZ.com. Thank you very much for subscribing. My aim is to provide you with information about what is happening in the world of IT that directly affects YOU. I'll also give you sneak previews of new content, hints and tips, and other changes coming to eComputerZ.com - keeping you that step ahead and doing all the research so you don't have to! Microsoft's replacement for the disastrous Windows 8/8.1 Operating System(s) is set for consumer release on Wednesday 29th July 2015. Microsoft are releasing lots of details about new features in Windows 10 and improvements made over previous operating systems. In fact, leading up the official release date, Microsoft are updating and issuing builds to those early adopters who applied the technical release to their machines via the Microsoft Insider Program. Build '10158/59' come with over 300 bug fixes! Don't be surprised if Service Pack 1 is already in development! Microsoft expect to deliver Windows 10 to over 1 billion devices! 4 million machines already have Windows 10 installed! If you already have Windows 7 or Windows 8.1, you may have already seen this message on your screen. As the image above shows, Windows 10 is free. However after 12 months you are charged between £65 and £99, depending on how 'genuine' you copy of windows is and when you upgrade your current version. So what do you get with Windows 10? At the time of writing it is a moving feast, and lots of announcements are coming thick and fast. What we know is Windows 10 comes with Edge, Microsoft new web browser and replacement for Internet Explorer. There are SEVEN versions of Windows 10, ranging from a mobile version for phones and tablet devices, to the Professional version. Upgrade plans are already under way and are rumoured for release in two waves, scheduled for June 2016, then October 2016. The Start button is back! (Yes! I hear you cry). 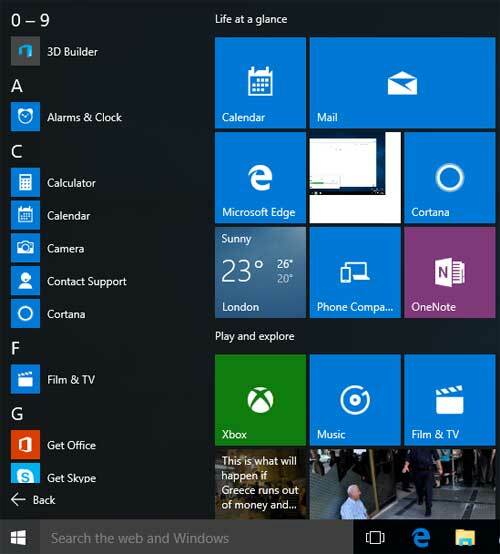 However it is a hybrid of the Windows 7 'traditional' start menu and Windows 8.1 'Live Tiles'. Cortana will expand in to Windows PC's and Tablet devices in addition to phones. This is Microsoft personal digital assistant competitor to Apples Siri and Google Now. For Gamers all Windows 10 devices will include the Xbox App. This enables seamless interaction between your PC and games console, such as recording game sessions and sharing them using the Game DVR tool. Windows 10 is about improved performance and seamless interaction between all your Microsoft driven devices, whether they be touch screen/gesture driven or standard keyboard devices such as PC's and Laptops. Apple release iOS 9 for all their mobile devices later in the year. Coming this Fall (July-September) is a new O/S rich with enhancements that should make both consumer and business users happy. The main feature that's buzzing around the IT Forums is the new multi-tasking feature. Slide Over means you 'can open a second app without leaving the one you are in'. The scenario is you are browsing the internet, then respond to a text message 'without leaving the browser' then slide the message app away and continue web browsing. This is focused on those quick jobs such as making a note before pushing that app away and continuing with the main task at hand. Split View is having 2 apps open side by side. 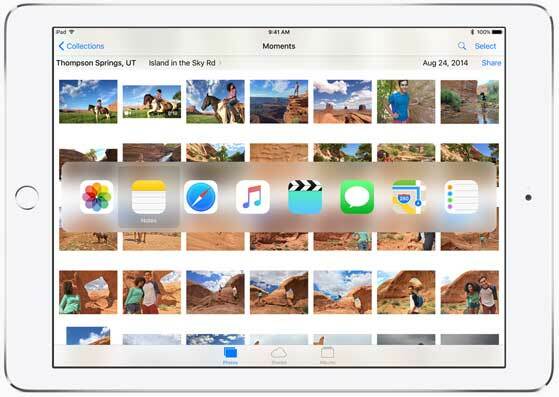 Note this feature is designed to work with the iPad Air 2 only. This will take a bit of getting used to. Hopefully you have nimble enough fingers to pull it off! Picture in Picture is the ability to press your home button on your iPad to scale down your FaceTime or movie whilst interacting with a second app. iOS 9 comes with other new features including a new App on your home screen that pulls together news articles you are interested in from a variety of sources. Sharing news articles with others is now more convenient and you can read them offline. Notes are now uploaded to iCloud and are available on all your Apple devices. You can also pull up the notes app with specific notes relating to whichever app you are in, and easily create checklists and include photo's. Apple Maps will include public transport details for whichever City you are in., even showing you the line of underground tube systems. Apple Pay enables you to make purchases with your Discover Card or Store Cards, including the ability receive and redeem reward points etc. Lots of other features are included such as a new shortcut bar, smarter interaction with vehicles through CarPlay, enhanced Siri commands, improved battery life of up to 1 hour and faster, smaller and more responsive apps and tasks. The changes apple have made in iOS 9 certainly whet the appetitie. I hope Apple deliver on their promises. Open DNS is an excellent and free way to protect your family from the nasty stuff online. Available since 2006, it protects your devices on your home broadband network from malware and filters internet access. OpenDNS now offer the Umbrella service. This is an extension of the protection provided on your home network, to all your families Apple iOS devices, wherever they may be. Go to the Open DNS site and try the Umbrella Service for free. Finally in this Newsletter edition let me tell you about some of the things that has been happening over the past few months with my website. With a new site design comes lots of advantages for mobile users. For example the site is now responsive to the type of device you are viewing it on and renders much better than before. 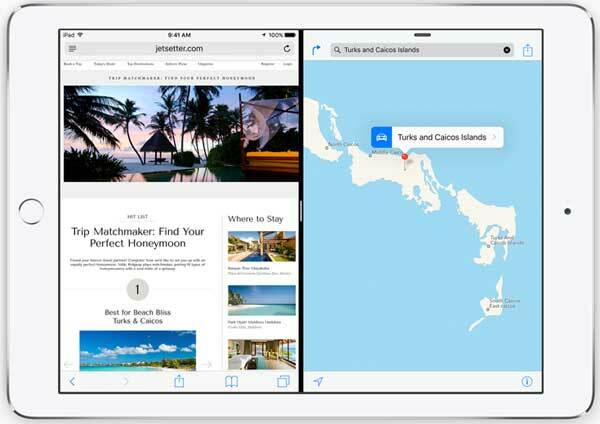 Images and video's adjust to the screen size of your device, whether it be an iMac, Tablet or android Smartphone. The font size is larger and clearer to make it easier to read. Each page has been carefully reviewed and updated. A fresher, more modern look is only a small part of the overall plan! Lot and lots of new content in planned. Over the coming days a whole new section will be made available that is devoted to computer tablets. We look at the different types of devices available on the market today, and specifically look at the iPad, including how to update to the latest iOS and understanding touch screen gestures and application management. To give you sneak preview of what's to come, click the link below to an as yet unpublished page. Finally the domain name of my site will change during the course of this month from Home Computer Support to eComputerZ. The motivation behind this is to make it easier for smartphone users to access the site. Thank you for taking the time to read my newsletter. In the next edition we discuss, amongst other things, wearable technology and the Free eBook I am currently working on, available exclusively for newsletter subscribers only!